It was time for a windowbox change here at Our Fairfield Home and Garden. Formerly lush summer plantings were becoming leggy and the blooms sporadic, so I wanted a transition into fall. Happening on a clearance table at the Michael’s craft store, two tiny fairy houses drew my eye and gave me an idea! And, for less than $5.00, snatched up the accents needed for my early fall windowbox. 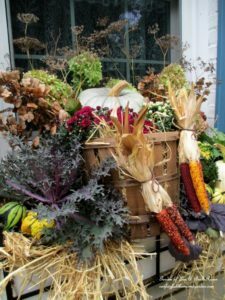 Less than a week later, an end-of-the-season road trip into Lancaster County’s Amish country provided the rest of our windowbox materials for a song. On a perfect fall day, I enjoyed seeing the Amish farms where the mums and gourds were grown and chatting with the proprietors. 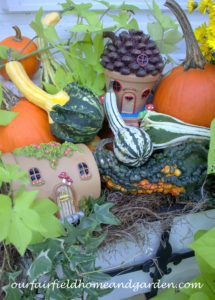 A quick and simple change-out only required that I remove the tired annuals and tuck in my farm finds and fairy abodes. Still trailing and green, the Sweet Potato Vine was spared. I’ll need to replace it when we get a heavy frost. But, for now, it gets a reprieve as our weather is heading into another warm spell for the next couple weeks. 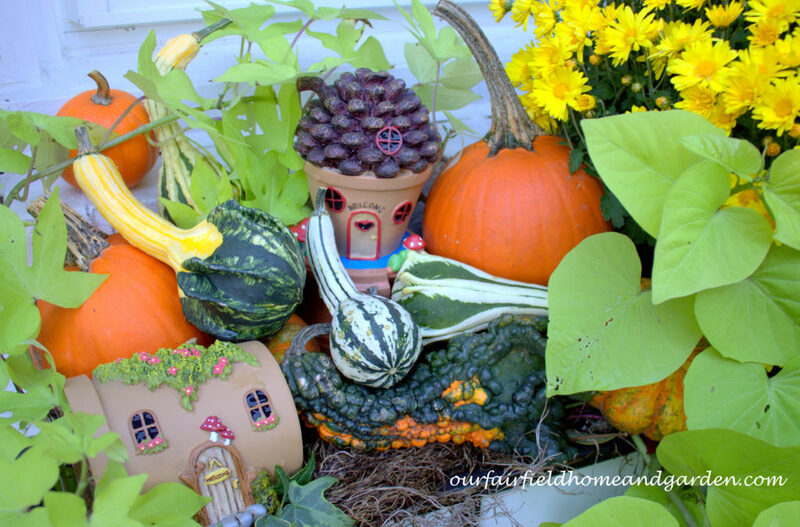 Quick and easy ~ make a Fall Fairy Windowbox! Doesn’t this look like a sweet spot for an autumn-loving fairy to reside? 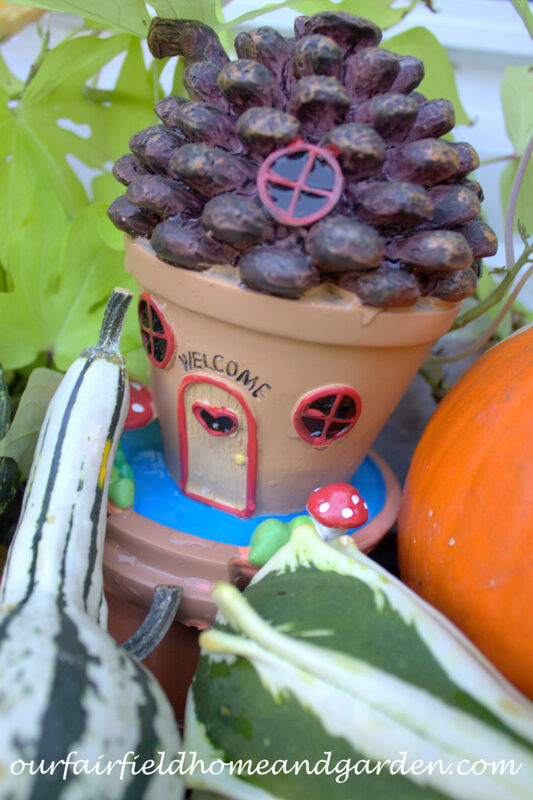 Best of all, putting the fairy houses in the windowbox made them much easier to view as you stroll up our walkway! These little Fairy Houses look cozy nestled in the remaining Sweet Potato Vine, surrounded by colorful fall gourds and pumpkins. 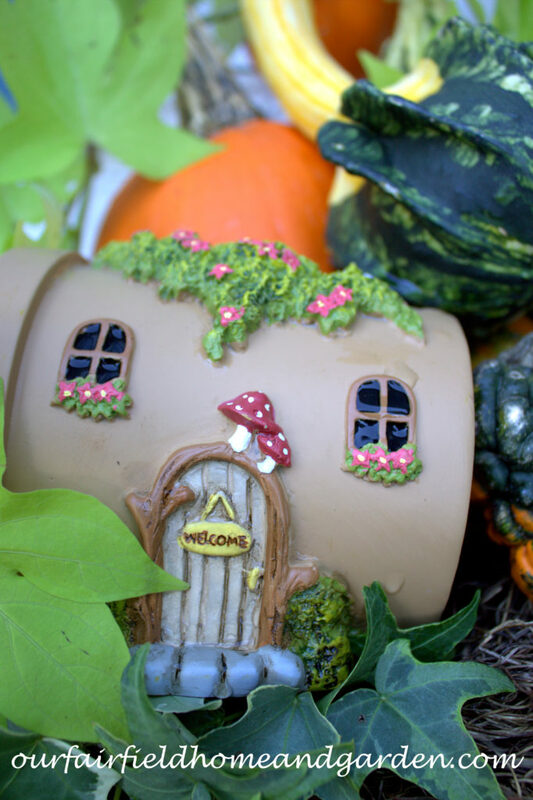 Made to look like a flowerpot converted into a home, this little fairy house is ready to move right in! Isn’t it dear? 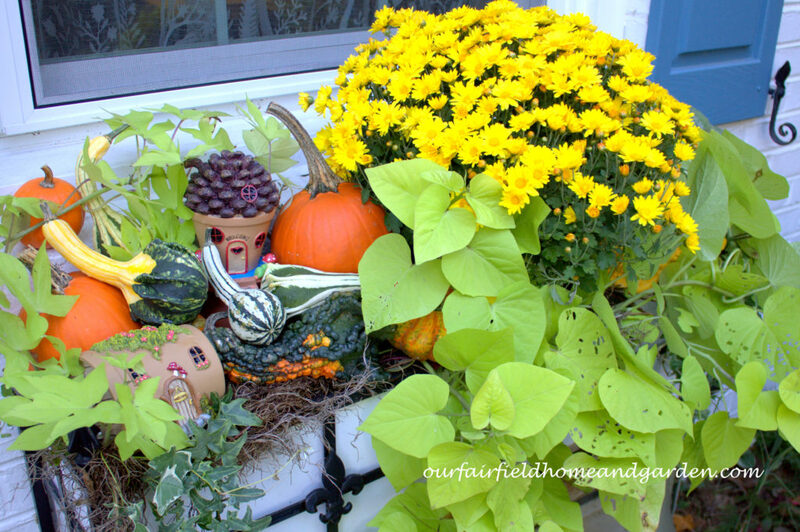 So, here is an early Fall window box made from my clearance finds and a fun road trip into the Lancaster County Amish countryside. What a fun transition into autumn! 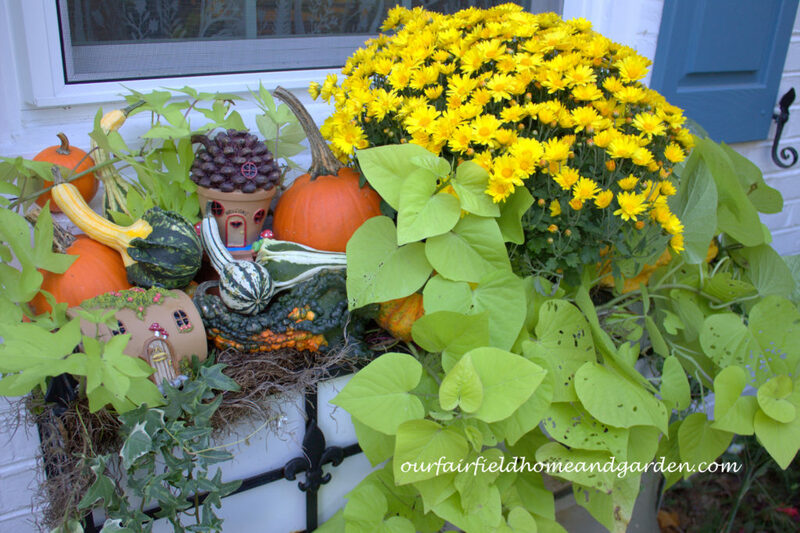 See more Fall windowbox ideas and outdoor decor from Our Fairfield Home and Garden! Sweet. Kind of thinking I want to live in that little brown fairy house. But you know…bigger. Happy Fall, my fave time of year. Happy Fall! Yes, a bigger version would be a sweet tiny house !